Who Remembers Rudy’s Sirloin SteakBurgers? 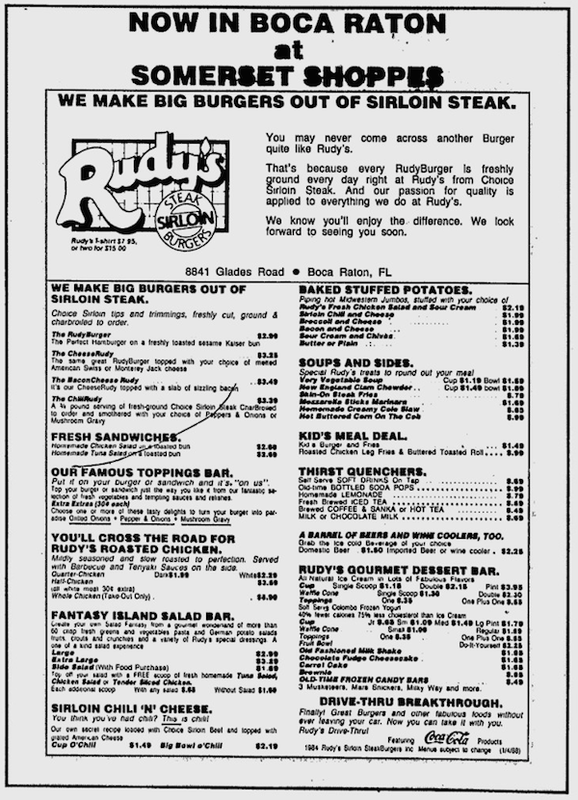 Rudy’s Sirloin SteakBurgers was a chain of Burger joints in South Florida from 1984 to 1991 (the last year I remember seeing one open). Douglas Rudolph was the man who brought Wendy’s to Miami-Dade County in November of 1977, later sold off those 22 Wendy’s South Florida locations in 1983 and founded Rudy’s in 1984. Rudy’s was a hybrid of fast food Burgers like Wendy’s and the little more upscale Fuddruckers. I can remember as a kid having a hard time making the tough decision between which I liked better. 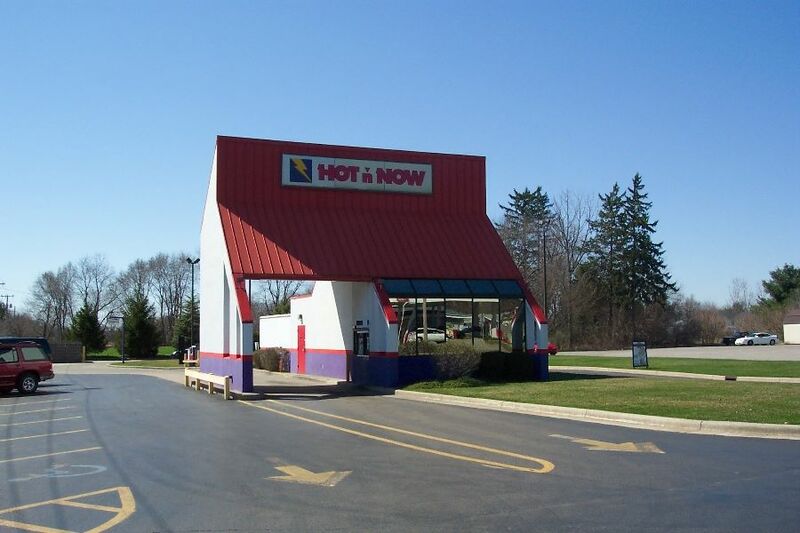 I preferred Rudy’s mostly because as a child I was a gigantic Char-Broil Burger fan, so really maybe a hybrid of Burger King and Fuddruckers is a better explanation of what the Burgers and restaurant were like. 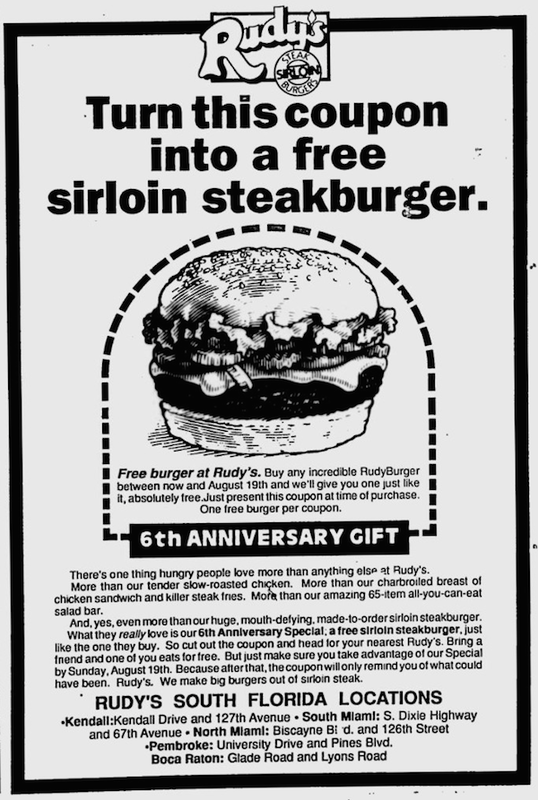 In June 1986 Rudy’s Sirloin SteakBurgers company went public. By January of 1991 Rudy’s, which was down to four locations at this point was sold off. 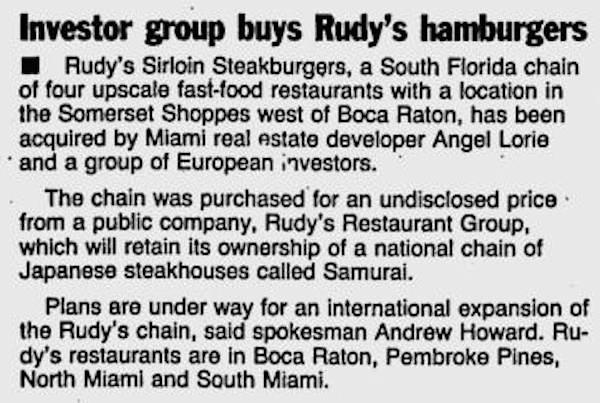 According to the article below from the Boca Raton News, the plan was for an expansion of the Rudy’s Chain which never materialized. The last time I ate at Rudy’s was in mid-1991 with my parents & grandparents. And then, they were gone. Got any memories of Rudy’s Sirloin Steakburgers? Leave them below, I’d love to hear them. I wish getting the recipe was that easy. I used to work for Rudy’s both in Pembroke Pines and then when I moved a little north to Sunrise and one day I showed up for work and the doors were all locked and we all lost our jobs..so sad! my best friend of 33 years met her husband there and they are still married with 3 kids today. I still have the name tag and I think some napkins and such from Rudy’s good memories my first job ever! Wow! Thanks for sharing. I’m jealous, I haven’t been able to find anything like that and I’ve looked! I worked there one summer. Job sucked. Burgers were good though.